Jerry Brown Orders California to Go Carbon Neutral by 2045. Is That Even Possible? Gov. 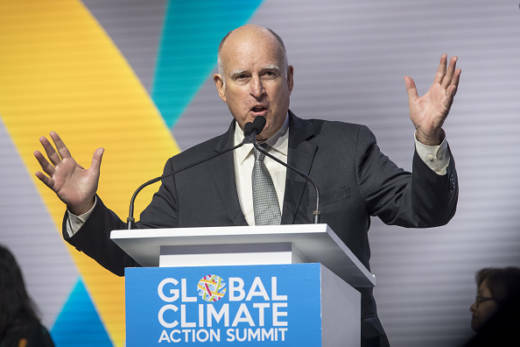 Jerry Brown, who has made climate preparedness a linchpin of his administration, issued a bold executive order during the recent Climate Action Summit in San Francisco. Brown is calling for the entire California economy to become carbon-neutral by 2045. That would mean deploying a combination of new technologies to vastly reduce the release of carbon dioxide and other greenhouse gases, plus the widespread implementation of methods to capture the rest, so that the state's net release of emissions already altering the climate in devastating ways would be zero. Vox energy and climate reporter David Roberts called Brown's announcement "surprising, strange, and stunning." But is it doable? KQED's Brian Watt spoke with Sally Benson, co-director of Stanford's Precourt Institute for Energy, to find out. The following is edited for length and clarity. The governor called for California to be carbon neutral by 2015. What does that mean? No plastic cups, no disposable diapers? Will I be able to use paper towels? Benson: Well, if we make them exactly like we do today, the answer would probably be no. We have to find completely different ways to make a lot of the products we use. Plastics, for instance, come from petrochemicals -- oil and gas. In the future we're going to need to find new ways to do that. We might use biological feedstocks. We have some other ideas about sophisticated chemistry that takes carbon dioxide from the atmosphere, together with water and 100 percent clean energy, and synthesizes plastics. That's a long way from now, but the seeds of those innovations are actually here today. Climate Summit: What Happened and What Does It Mean? But this has to apply to the whole economy, right? I mean, if we're talking about taking emissions out of driving, that sounds like doing away with the combustion engine. Benson: Well, exactly. So the strategy will be to electrify everything you can. And then the next thing is to address all those emissions you can't get rid of, things like making cement and airline travel, where it's hard to find substitutes. For those, we need to think about capturing the carbon dioxide that's emitted, then sequestering it in underground formations like oil and gas reservoirs, which California's got a lot of. We can also plant more forests and change our agricultural practices to store more carbon in the soil. But we're talking about sweeping changes across the entire landscape of how we use energy today. Just between you and me, is this realistic? Benson: Well, I would say it's aspirational. And also realistic. You know 100 percent is really hard, and we're going to have to make major technological changes in order to achieve this. And no doubt, if California's successful, we will be on the leading or perhaps bleeding edge of those kind of new technologies.